“Think well. Speak well. Do well. This week’s saint reminds us that our past does not define our future — it is never too late for us to turn a new leaf! Before he started caring for others, St. Camillus de Lellis was anything but saintly. He was lazy, hated school, had a fierce temper, and got in a lot of trouble for excessive gambling and fighting. However, after the death of both of his parents, Camillus finally resolved to mend his ways. He went back and forth between joining a Franciscan Order, working at San Giacomo hospital in Rome, and joining the Venetian army — every time being kicked out either for a wound on his leg that refused to heal, or for his problem with gambling and fighting. Years later, in his role as superintendent of San Giacomo hospital, he realized that it is only when there is genuine love from the nurses to the patients that they would provide adequate treatment; thus, raising the standard of care. After realizing that both laymen and priests ought to be in this field of work, he felt his calling to the priesthood. He was ordained in 1584 and started a group that would care for the sick and dying on the streets. They wore red crosses on their clothing to be distinguished in a crowd. By the time of his death in 1614, Camillus had founded more than 30 hospitals. Talk about a change of heart! 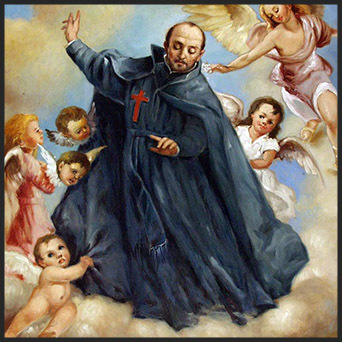 Glorious St. Camillus, turn your merciful eyes upon those who suffer and those who care for them. Grant to the sick Christian resignation and trust in the goodness and power of God. Make those who take care of the sick be generous and lovingly dedicated. Help me to understand the mystery of suffering as a means of redemption and the way to God. May your protection comfort the sick and their families and encourage them to live together in love. Bless those who dedicate themselves to the infirm. And may the good God grant peace and hope to all. Amen.